Greenplum Database® is “Massively Parallel Postgres” for analytics, machine learning, and AI. With its unique cost-based query optimizer designed for large-scale data workloads, Greenplum scales AI, interactive and batch-mode analytics to large datasets in the petabytes without degrading query performance and throughput. Greenplum is based on Postgres and is fully equipped with the analytical tools necessary to help you draw additional insights from your data. We’re excited to announce the agenda for the second annual Greenplum Summit. The schedule is packed with great sessions from Greenplum users and experts, including advanced customer case studies, in-depth Greenplum tutorials, and emerging best practices in Postgres-based data analytics. We will also be showcasing an impressive array of industry-changing product announcements that you won’t want to miss. Check out the complete Greenplum Summit agenda now. 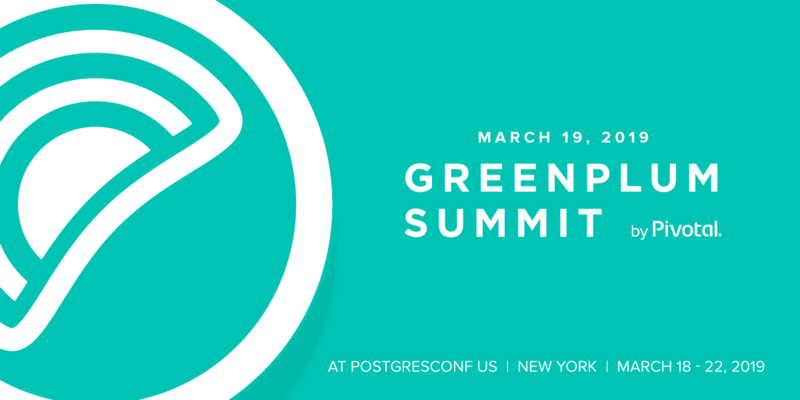 A single pass gives you full access to both PostgresConf and Greenplum Summit. Get a 25% discount on PostgresConf registration with promo code “2019_GREENPLUM”. Register now – see you in New York! Next: Next post: Netezza to Greenplum Webinar – Feb 13.